When the 14th Dalai Lama visited campus for two days in October, our digital media producer Brendan Mahoney ’11 was afforded special access to His Holiness. This insightful, touching video is the result. This entry was posted in Midd Blogosphere and tagged Dalai Lama, Dispatches, Featured Multimedia on November 6, 2012 by Middlebury Magazine. 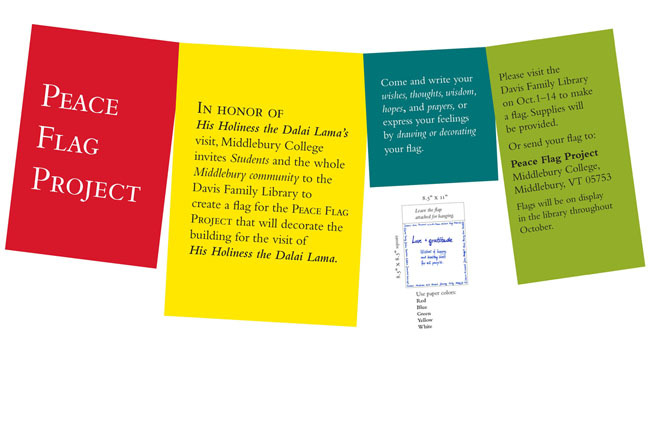 This entry was posted in Midd Blogosphere and tagged community, Dalai Lama, eNewsletter, library, Library Spotlight, LIS Staff Interest, Middlebury Community Interest, Peace Flag Project, Post for MiddNotes, Post for MiddPoints, Tibetan Peace Flags on September 21, 2012 by Marlena Evans.